Half a dozen knickknacks line the windowsill in new education professor Steve Holtrop’s office. A glass sailboat, a glass apple and a foam brain may be the most significant of the trinkets. In some ways, these three ornaments outline the development of Holtrop’s philosophy of education. One of Holtrop’s first influential teaching experiences occurred on a sailboat. Holtrop worked in the waterfront staff of a Boy Scout camp when he was 16. He was responsible for teaching sailing as a part of the maritime badge. Holtrop had a week of 1 hour sessions to teach his students how to sail. At the end of the week, the boys would be tested on their skill. Holtrop realized that he enjoyed putting the concepts of sailing into everyday language. “That was probably when I first thought, ‘Hey, I could enjoy being a teacher,’” he said. Holtrop earned a B.A. in English from Calvin College and an M.A. in English and journalism education and Ph.D. in English education from the University of Iowa. “I think one of my strengths is that I am interested in everything,” he said. Accordingly, Holtrop appreciates English because it dabbles in a little bit of everything. 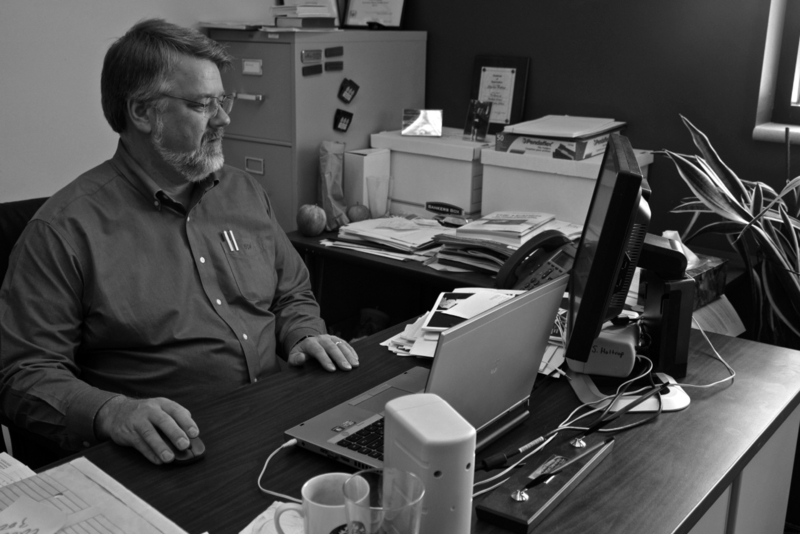 Holtrop combines his appreciation for a wide range of subject matter with his passion for “helping students take their knowledge to the next level” in depth as well as breadth. Holtrop does this by promoting critical thinking. While studying for his Master’s examination, Holtrop was disappointed to discover that the test consisted mostly of surface-level memorization and very little critical thinking. He was told that material would be covered more in-depth in the Ph.D. program. This response disagreed with Holtrop. Holtrop cares deeply about critical thinking. He believes it is important for students of all grade levels. “I am opposed to memorization,” he said. Holtrop never gives multiple choice tests, and he tries to avoid memorization-only tests. He endeavors to demonstrate to his students (who are future teachers) that there are alternatives to factual tests. Holtrop believes that, if students are asked to engage with the material, and think deeply about it, they will learn the facts. According to Holtrop, many of the problems the world of higher education faces are a result of the reliance on “regurgitating facts” and neglect of critical thinking. Holtrop is passionate about developing new programs that allow students to engage with the material they learn. Holtrop thinks he has found a place to develop such programs at Dordt. “My first months at Dordt have been great. The students are great. They are smart and engaged,” he said. “I am excited to be at Dordt, because there are innovative things happening here.” Holtrop believes that Dordt will be able to stand up to the challenges that face the world of higher education.